🎹 UPDATED REVIEW COMPARISON - April 10, 2019 - Yamaha CLP635 vs CLP645 vs CLP665GP Digital Pianos - Recommended - The 2019 Yamaha Clavinova pianos include the CLP625, CLP635, CLP645, CLP675, CLP685, and CLP665GP mini grand piano. In this review I am talking only about a comparison review of the CLP635 in matte finishes ($2699US internet discount price) and CLP635 in polished ebony ($3199US internet discount price), CLP645 in matte finishes ($3499US internet discount price) and CLP645 in polished ebony ($3999US internet discount price), and CLP665GP mini grand piano in polished ebony ($5499US internet discount price) and CLP665GP mini grand in polished white ($6299 internet discount price). 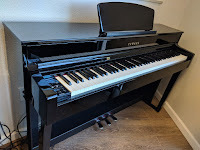 The reason for me doing a comparison review about these three specific models is because they are the most popular Clavinova models that Yamaha produces but they are also in the lower price range of Clavinova models, with the exception of the mini-grand. The other two higher priced Clavinova 600 series models share the same control panel, same acoustic piano samples and polyphony, and overall operate pretty much the same way with the exception of the basic entry level CLP625 which I am not discussing here in this review. I also want to say that the reason I am including the CLP665GP mini grand in this review, which is at a higher price, is because the CLP665 is identical to the lower priced CLP635 in every way except for cabinet (obviously) internal speaker system, and Bluetooth connectivity. So the CLP665GP is really a CLP635 in a different and highly upgraded cabinet with a more powerful internal speaker system and an extra connectivity feature which I discuss later. Having the mini grand version will definitely look very elegant in any room assuming you can fit it in, but it will cost you more money. 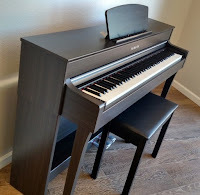 If you want to spend even less money and be in a lower price under $2000 then check out my review of the Clavinova CLP625. Although it is basic in design, it does put out an impressive piano sound and a good volume in a nice looking cabinet. 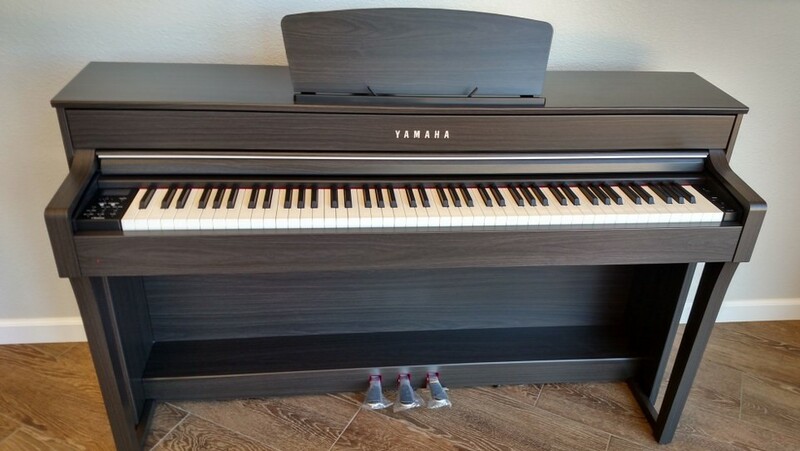 Yamaha has been producing the Clavinova digital piano series for many, many years and they have a good reputation for being high quality instruments. However in past years I have not been very fond of the piano sound in any of these models because they just had an overly digital tone to them...they just did not sound real to me at all and did not have good resonate sustain and longer decay piano tone. Beyond that the previous control panel operating system was not user friendly, difficult to operate in selecting the functions you wanted, and the black plastic material on the control panel looked cheap and scratched easily. 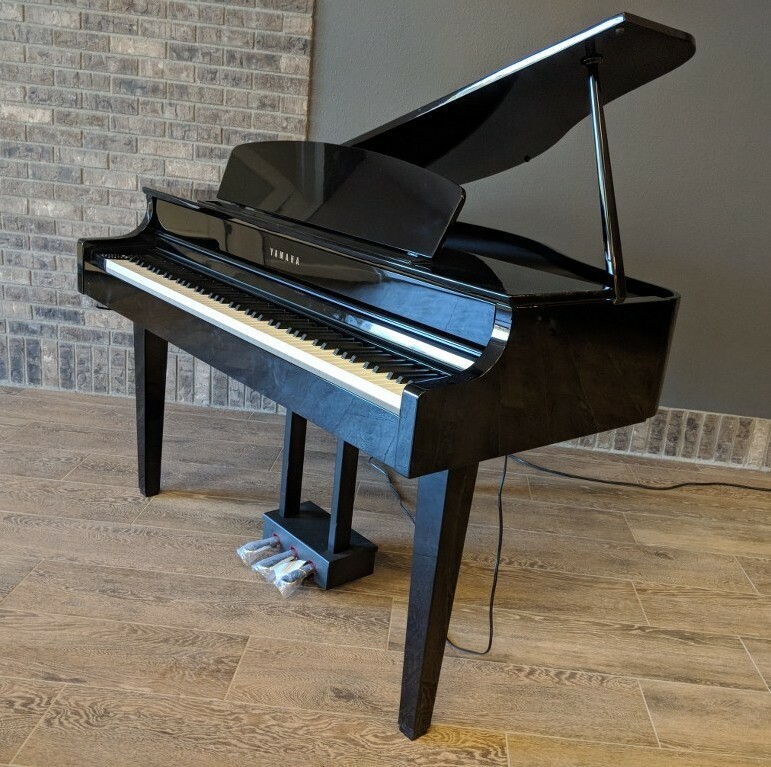 So I was quite surprised when I saw and played these new CLP635, CLP645, and CLP665GP pianos because they looked better and had a much different, more natural piano sound due to a new technology that Yamaha previously only had in their more expensive Clavinova's and now has it in these lower priced models. 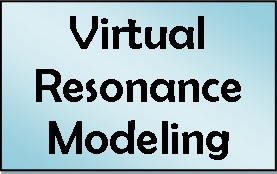 The technology is called "Virtual Resonance Modeling" and it calculates the actual real time as you play the actual tonal response that a grand piano would offer throughout the body of the piano, the interior of the piano, the way all the strings vibrate in a real piano when the hammers hit different strings at different times, and so on. What all this means is that because of the new piano sound technology in the CLP635, CLP645, and CLP665GP, the pianos just sound more natural and organic and not as "digital" like they did before in previous models. Yes, they are still digital pianos and certainly won't sound exactly like a high quality acoustic grand piano, at least not yet, but these new models have certainly improved in the area they were most lacking. For someone who has not had much experience with a real acoustic piano or even if you are an advanced pianist, then you should easily be satisfied with the piano sound of these new models. Beyond the piano resonance modeling, the tonal dynamic range of the piano sound when playing the keys from soft to hard (slow to fast) has gotten better, although still needs some improvement in my opinion because acoustic pianos still have a wider range of tonal expression as compared with these digital pianos. 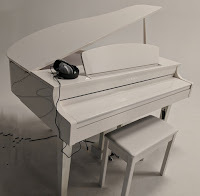 However there are editing functions such as brightness control, touch sensitivity control, etc which allows you to "tweak" the sound expression so that the dynamics can be adjusted to be even more expressive and in that way the piano expression (tonal dynamic range) can become wider and larger...something that is important as you become a more advanced player. 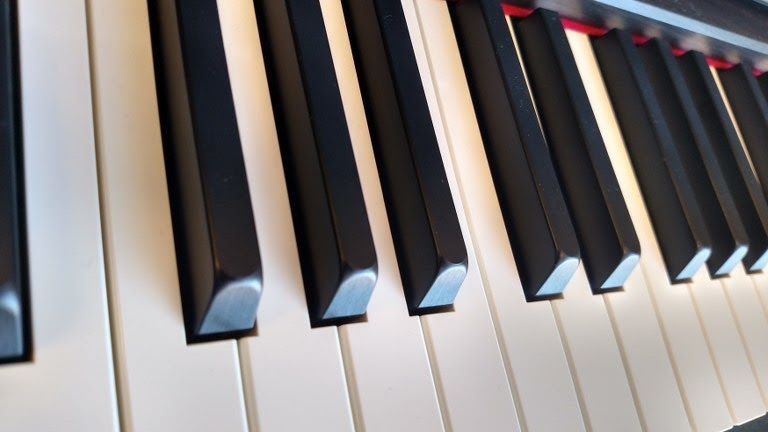 For beginners or recreational players, all these things such as resonance, dynamic range, expression, etc, will not be important yet because beginners have many other things they need to learn before they ever get to these more serious parts of the piano sound and playability. But once they do progress in their playing abilities, then this CLP600 digital piano series will deliver the kind of tonal expression that students and musicians alike expect out of a good piano. 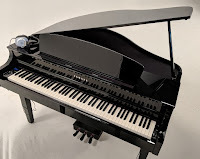 Yamaha makes a big deal about having two professionally recorded super wonderful (they would want you to believe that of course:) grand piano samples of their real concert acoustic grand pianos in their new Clavinovas which they call the Yamaha CFX and the Bosendorfer Imperial. Both of these acoustic pianos are incredible instruments in real life and sound great. But to translate that into a digital instrument is not easy and the results are sometimes not so good. These two piano sampled recordings were in the previous models as well, but in the previous models and as I mentioned earlier, I felt the pianos sounds were just too digital in how they came out of the internal speakers and also headphones. The Yamaha piano sound in the previous clavinova models was better than the Bosendorfer piano which did not sound real to me at all. In these new 600 models the two piano sampled recordings for some reason (could be the new resonance technology) sound much better and more precise both through the internal speaker systems and through headphones. They have a much more natural tone to them that I enjoyed playing and even the Bosendorfer piano sound which is the more delicate and mellower of the two, was much more realistic which was nice to hear. With 256-note polyphony piano processing power and the ability to edit the piano sounds in different and more intuitive way than other digital pianos, I believe that most people will really enjoy the acoustic piano sound experience in these new models and those two piano sampled recordings are in all models of the the new CLP600 series with the exception of the basic model CLP625 which I talk about in another review. The feel can differ greatly from one to another in acoustic pianos and they also differ from one model to another and from one brand to another in digital pianos. The CLP635 has an all plastic key action that is (slightly) graded in weight from left to right and has a certain "feel" when pressing down the keys. The key action on the new CLP635 is the same in weight and feel as the previous CLP535 so that has not changed. The key action also has what's known as "escapement" function which is a slight hesitation when slowly pressing the key down to the bottom and just before getting to the bottom you would feel this hesitation or notch which is trying to duplicate the experience of a grand piano because grand piano key actions do this and this function can be helpful when playing slowly and giving you more control over the key movement and sound, especially if you are an advanced player. It is important to note that in my opinion this "escapement" function on the CLP600 series just doesn't feel right to me because it's so light and almost non-existent even when playing softly. I've played literally thousands of high quality acoustic grand pianos in my pro music career and I believe I know what this "escapement" function is supposed to feel like, and in all of the CLP600 series the escapement just feels a bit fake to me, not realistic. Hey that's my opinion for what it's worth and this so-called escapement function (other digital piano brands have this feature as well) really doesn't matter at the end of the day to most people and does not diminish the positive piano playing experience I had overall with these Clavinova pianos in any way. Oh, and just so you know, the "escapement" key feel does not exist in real upright acoustic pianos (you cannot feel it in regular uprights) and thousands of families own real upright pianos (Yamaha makes some great ones) and I enjoy playing them very much. So basically in my opinion, you can just overlook this feature because even Yamaha says in their literature that you have to play very lightly to feel the escapement function at all and in acoustic grand pianos it's really not like that based on the top grands I have played. Besides, even the other digital piano brands who say they have this "escapement or let-off" feature in their key action don't come close to what it really feels like because they are all very limited imitations of the real thing. So I recommend you do not get overly concerned about this:). OK...now that we're through dealing with the key action feature called escapement, I need to mention something very important with regards to key action and that's the "down weight" of the piano keys or the "feel" which I mentioned a bit earlier. The key action "down-weight" simply means how much pressure it takes from the fingers to press down the keys...also known as finger "touch weight." Being that the new CLP635 has the same key action with down-weight as compared with the previous CLP535 which is also the same key action that's in the mini grand version CLP665GP, the down-weight is the same in those pianos which in my opinion may be a bit too firm for some people when pressing down the keys as compared to a real good grand piano or even some good upright pianos...at least that's the way I felt about it. Down weight is actually measurable with lead weights that piano technicians use to determine if the key action is too stiff, too light, or just right! This does not mean the Yamaha CLP635 and 665GP key action is not going to be enjoyable to play for many people because regular acoustic pianos can have slightly heavier/firmer key actions as well. It just means that you should understand what you would be getting because to me the key action may be a bit fatiguing to play after awhile unless you have stronger finger muscles or just prefer a slightly firmer key action which some people do. However, in the CLP645 model, the key action is different than the other two in that the inside of the key is made out of natural wood rather than plastic and is balanced a bit differently to give it a somewhat lighter, more responsive feel as compared to the CLP635 or CLP665GP mini grand version. I feel that the CLP645 is a bit more expressive and more enjoyable to play because of its lighter all wood keys and key movement especially over long periods of time as compared to the CLP635 firmer plastic key action which Yamaha calls GH3. So one of the upgrades and advantages in the CLP645 is the key action and the way it feels and moves. In my opinion if you can afford to go up to the CLP645 over the CLP635 (and that certainly does bring up the cost quite a bit) then that's what I would personally recommend because of that difference in key action, but there are other reasons such as the internal speaker system, but we'll talk about that later. Also with regard to the key action, both the GH3 plastic version and the lighter wood version are very quiet when it comes to any key action noise that is heard when the keys move which is not true of some other brands and models. 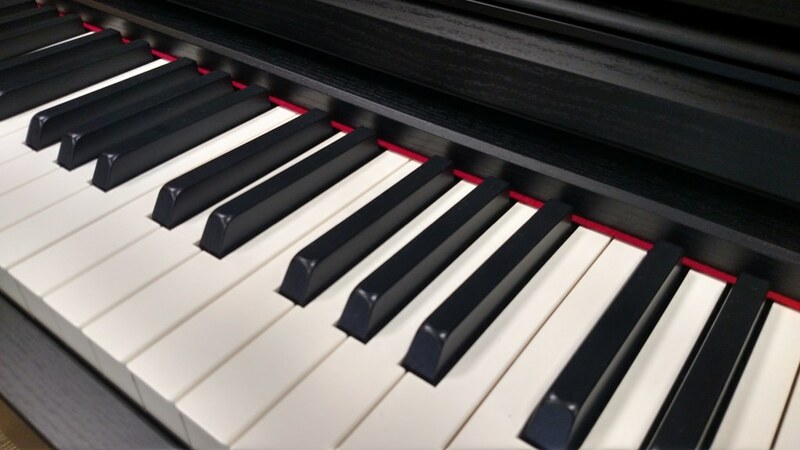 However, all keys in key actions make some noise when they move up & down but the Yamaha key movement in the Clavinova models are fairly quiet and durable in construction and this also makes for a good piano playing experience. Also in all of the Yamaha keys actions they have an electronic triple sensor system under each key that allows more more rapid response and recognition when playing keys in a repetitive fashion, especially if you are a more advanced played. 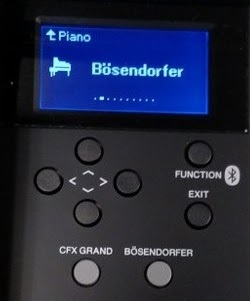 Triple sensor key actions have becomes standard in most digital pianos these days so unlike a few years ago when many pianos had less then three sensors per key, today's key actions mostly have this feature even in very low price ranges. 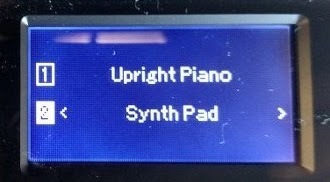 So although this is a very good feature to have, it really is not special anymore and has mostly become standard and normal in many digital pianos. This is also true for the synthetic textured ivory and satin ebony key tops digital pianos these days. This is a nice feature that allows the key tops to help absorb sweat from the fingers and it also looks classy too the way that regular acoustic piano keys used to be many decades ago. 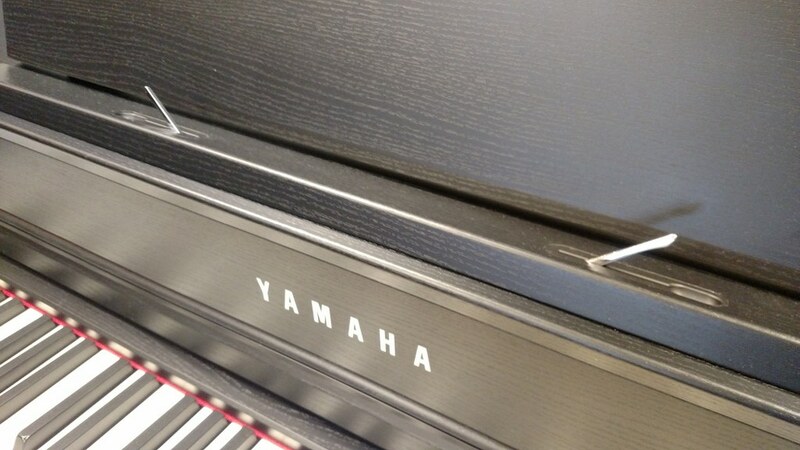 The Yamaha synthetic ivory and ebony is especially nice in the way it feels to the fingers. The pedaling on these pianos is quite good and works like a real acoustic piano in having the sustain/damper, the sostenuto, and soft pedals. The pedals are full size and the damper pedal can trigger what is known as "half-damper" pedaling allowing for smoother and more natural sustain when you are holding your damper pedal down in different positions. Also and as I talked about before, the sustain decay time (the length of time the sustained not keeps going before it dies out) is noticeably much better, fuller, and louder than in previous models and this adds to the overall realism of the piano sound and piano playing experience. This extra decay time was really good especially on the middle and upper octaves of the notes where sustain and decay time is normally weaker and more difficult to achieve in digital pianos. So this was a big upgrade in natural sound especially when playing more legato with sustained tones. There are "extra "bells & whistles" in the CLP635, 645, and 665GP just like in previous models with additional non-piano instrument sounds such as strings, organs, electric pianos, harpsichords, etc with a total of 36 instruments and those orchestral instruments do sound good, not cheap like some other digital pianos I have heard. Any two instruments can be layered and combined together which can make your music sound even better, split the keyboard at any point with one sound on left hand and one on right hand, or one piano sound played by two people independently at the same time which is called "duo piano" and useful when two people are practicing the same song at the same time and want to have the same notes. 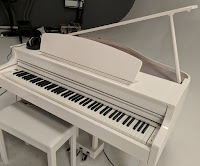 The 600 series pianos also can record up to 16 different (MIDI) tracks using up to 16 different instrument sounds one at a time for composing and song creation and then play them all back simultaneously which is fun. The CLP635, CLP645, and CLP665GP mini grand version both have 20 drum rhythm patterns now which helps with rhythm and timing and also makes it more fun to play more contemporary music with a "virtual drummer." Previous models with the exception of the previous CLP545, did not have this feature. 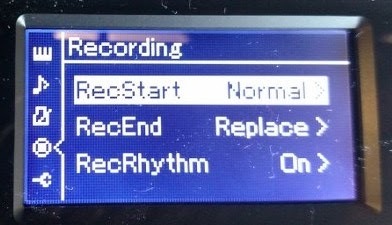 There is a also 1-track wav file audio recording to record how you actually sound when playing a song and then you can save that in a USB flash drive (just like with the 16 track MIDI recording) and then transfer that audio recording on to your computer for further work in software programs or conversion to MP3 file for playback in personal devices. 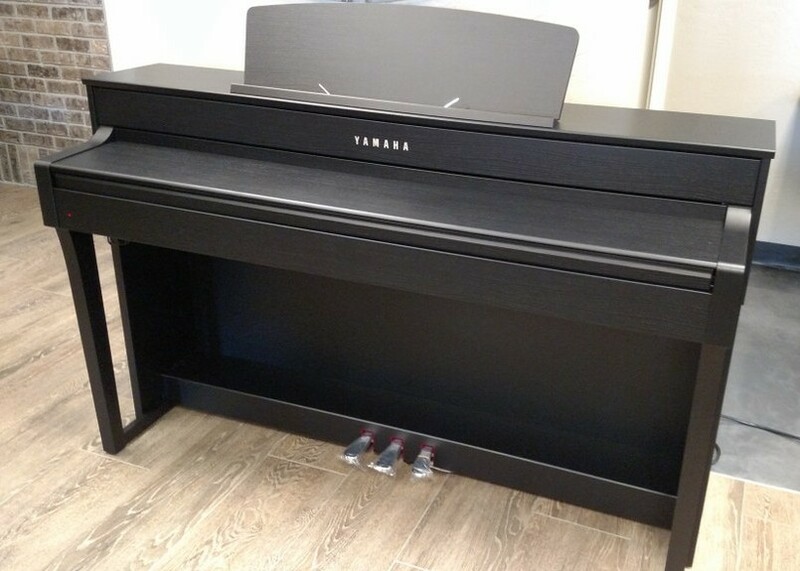 There are other useful but common electronic features such as reverb, chorus, and brightness control, but one feature which Yamaha has in these lower price models that other pianos do not is something called "Piano Room" which is directly accessible from the control panel buttons. So...picture a room in your mind that has a virtual grand piano in it, or maybe an upright piano, or whatever kind of piano you choose. The room size could be bigger or smaller, there could be less or more natural acoustics in the room, you may want to raise or lower the lid of your virtual grand piano or quickly change the touch of your piano. With the virtual "Piano Room" control you can now design your own custom piano sound and room environment very quickly so that you can make your own custom Yamaha or Bosendorfer piano. This is a pretty cool feature and is also found on the more advanced and higher priced CVP700 Clavinova series although the Piano Room controls are much more extensive on those models. I like the fact that Yamaha has included their virtual Piano Room feature in all of their new CLP600 series (with the exception of the lower priced basic CLP625) because it offers intuitive control and performance over the acoustic piano sound which is very nice. In the previous models two of the things I definitely did not like at all was the material used on the left side button control panel and also the operation of the control panel as I mentioned in the beginning of this review. On the CLP500 series there was shiny black plastic materiel on the left control panel and it was just cheap looking and didn't hold up well in my opinion. In the new models Yamaha has listened to my complaints (no doubt among others) and replaced the poor quality plastic with a new satin black material which looks like it won't scratch, won't leave fingerprints, and just looks more expensive and classier. 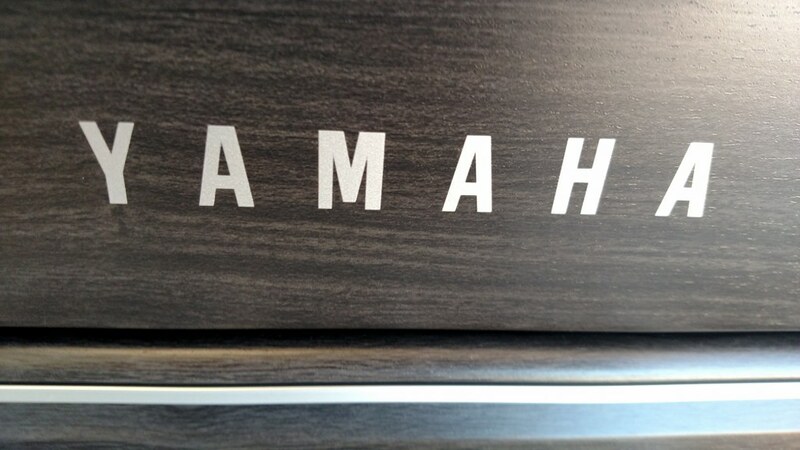 This a very welcome change and it's nice to know that big piano manufacturers are sometimes willing to admit their mistakes and move on to something better, which in this case Yamaha definitely improved this area of the piano. Apart from this new control panel material and aesthetics, the control panel buttons and functions have been revised to be much easier to see, easier to use, and operationally more intuitively. These two control panel upgrades apply to all the new 600 series models with the exception of the basic CLP625. So even in design Yamaha has made some noticeable improvements and it's these things that help make the overall package more impressive. 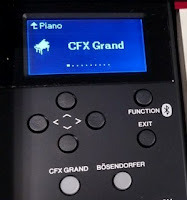 All three models here have good connectivity features including dual stereo headphone jacks, audio inputs and outputs jacks, MIDI connectors, USB flashdrive input, and USB to host output connector. However this year the new CLP645 and CLP665GP mini grand also have Bluetooth audio connectivity which will allow you to play your music from external Bluetooth music devices such as your mobile phone, iPad, etc through the piano speaker system to allow for your music to have a fuller more impressive speaker system to play through as well as being able to play the piano live along with your song being heard through the piano. This is a very cool feature and one that more people are wanting and more manufacturers are starting to include in some of their digital piano models. When it comes to connectivity these new CLP600 models offer most (but not all) of the functions people are looking for. It is good to be aware that the Bluetooth feature is not available on CLP600 Bluetooth models sold in certain countries. This is because of local and/or national regulations that prevent wireless Bluetooth transmissions from being included in products. So please refer to the Yamaha Clavinova owners manual for more info on this subject. When using headphones for private practice Yamaha has also upgraded this experience with new electronics they call "binarual sampling." What this technology does is allows for the piano sound coming from the piano through any good quality stereo headphones to sound more natural. When listening to a real piano your ears hear the sound in a multi-dimensional way where the sound is not just exclusively coming into your ears left & right, but you also hear the sound with respect to distance, position, up, down, behind you, in front of you, and all around you. A regular headphone experience cannot do this but some digital piano companies now, including these new CLP600 series offer this more organic listening experience so that the sound seems like it is being heard naturally, almost like you are not wearing headphones at all. 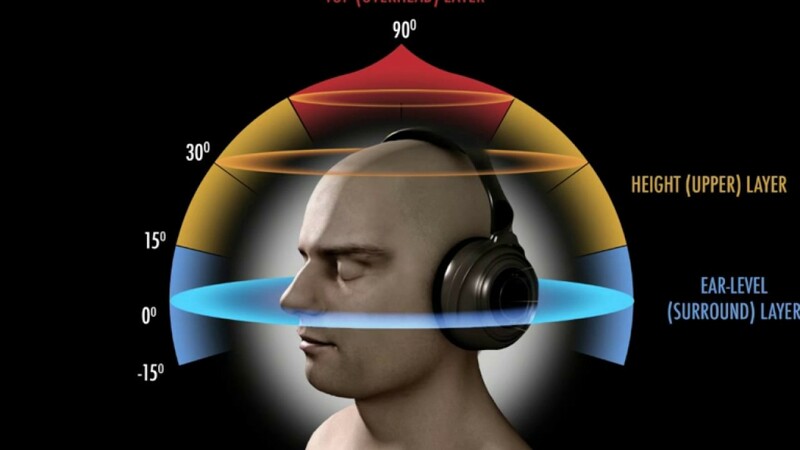 This makes the headphone listening experience more authentic, more comfortable, and more "alive." If you are going to be using headphones with the piano to play in privacy, then you will like this new binaural headphone experience. One of the most noticeable differences in these three Yamaha models is the internal speaker systems. The CLP635 has 2 larger speakers and 60 watts of total power going through its 2 amplifiers in stereo and offers plenty of power and bass response along with a good frequency range. However the CLP645 is upgraded as compared to the CLP635 with 4 speakers and a total of 100 watts going through 4 amplifiers and offers and even greater range of frequency response and harmonics with this upgraded system and there is a noticeable difference between the 645 and 635 models in this way. 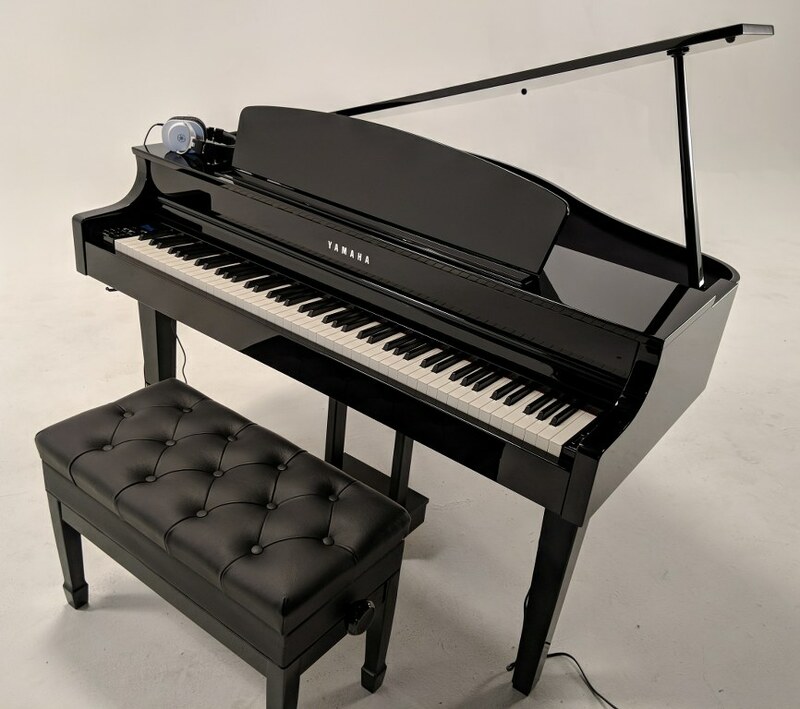 The CLP665GP mini grand version which otherwise (except for cabinet and Bluetooth function) is the identical piano to the CLP635 in every other way has an internal speaker system with 4 larger speakers and a total power of 70 watts going through 4 separate amplifiers. So it will have a better sound system as compared to the CLP635 and the speakers can project the sound upward like a little grand piano and it does sound good, but the CLP645 has the best speaker system of the three models, so it just depends on what you can afford to pay and what you want. All of these new CLP600 series pianos I mention here have attractive cabinet designs with front support legs for the upright styles in a variety of attractive matte finishes along with the more expensive polished ebony finish (also polished white in the mini grand) with adjustable music racks, nice sliding key covers, and a comfortable matching bench included. My favorite cabinet finish in the upright style is the new "dark walnut" color which doesn't actually look walnut or brown but instead looks like a slightly whitewashed grey with hints of brown in the grain (as you see in my above pics of the pianos)...very attractive and contemporary and can likely match a variety of interior designs. The regular satin black and rosewood finishes are always nice as well along with the more expensive polished ebony. Those CLP635 and CLP645 upright cabinets in satin finish measure approx 57" wide, 18" deep, and weigh in at 123 lbs for the CLP635 and 132 lbs for the CLP645. All three models have sheet music holder clips that can pop out of the lower area of the music rack which can help hold pages in music books, etc. The CLP545 has attractive solid metal clips vs the CLP635 with dark plastic clips. 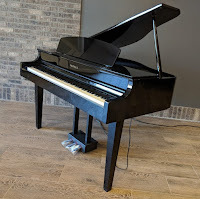 The Yamaha factory 5 year parts & labor warranty is a good one and long enough to take care of the piano which over the years has shown to be very reliable and durable based on all my experience with them. 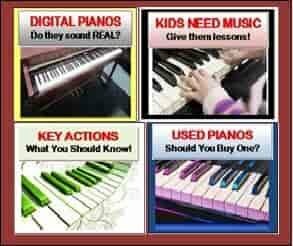 I did want to mention that I have people contact me all the time looking for a high quality digital baby grand in a reasonable price range and they want to know what I suggest. There are really just 4 price ranges for digital grand pianos, depending on their size and construction. You have the "under $2000US" which is typically occupied by inferior brands and models of digital pianos when it comes to authenticity, especially with key actions, piano sound, and pedaling response. Those brands in my opinion can include Williams, Artesia, and Suzuki to name a few. Then there are digital pianos priced at between $2000-$4000US which tend to be larger in size with more powerful internal speaker systems and those models can include Williams, Artesia, Suzuki, Kurzweil, and others with a couple of those models being OK but many are not. Then there are the digital grand pianos between $4000-$7000US which include Samick, Yamaha, and Roland. All of those brands are very good with certain ones offering a more authentic piano playing experience while others may be good but also offer more interactive "bells & whistles" than other models. Then there is the price range of over $10,000 which is occupied by Yamaha, Roland, and Kawai. All of those models in that price range are really impressive but they better be great considering how much they cost, with the Kawai CP1 5'3" digital grand at the top with a retail price of over $20,000US! 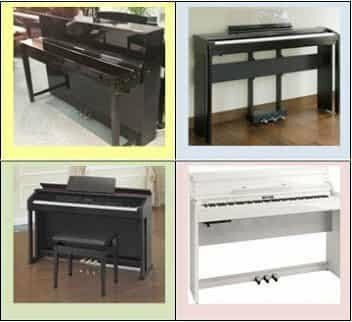 There are not near as many offerings in the digital piano industry as far as digital grand pianos go as there are in the traditional upright size cabinets whether those cabinets are compact or fuller traditional furniture type cabinets. Musically speaking you can normally (with few exceptions) get more for the money and it probably would cost you less money if you go with an upright style digital piano (vertical cabinet) as opposed to the baby grand style digital piano...but then you would give up the elegant and professional look of the baby grand style and many people want that look in their home, church, school, etc. So it just depends on what you want and how much you are willing to invest to get it. 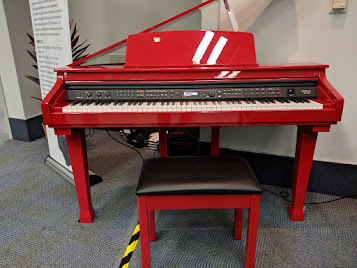 There are other things these pianos do including having built-in piano songs, the ability to load new MIDI piano songs through a USB flasdrive, and a few other features, but the main focus of the CLP635 vs CLP645 vs CLP665GP is for people of all skill levels to play piano on. My preference for the CLP645 when it comes to a vertical upright cabinet as compared to the others because of the more expressive key action and upgraded internal sound system, but overall all three models are enjoyable to play and can be a good investment for you and/or your family. They definitely look good too but I would recommend you do your homework so you can purchase the piano brand, model, and be in the price range that best fits your needs. 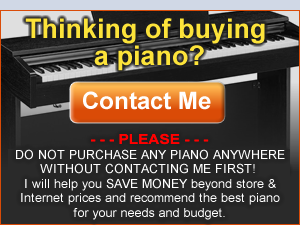 However, please contact me first before making any buying decision on any piano and I can tell you how to save even more money than internet pricing whether it be local stores, Amazon, or internet stores if you are in the US. Can I connect an iPad to the CLP-635 through the USB TO HOST port and use some basic functionalities of the Yamaha Apps? I would prefer to avoid having to buy the wireless adaptor. yes, a USB cable connection to external device simply allows you to connect to all the same functions and features instead of that connection being wireless. I procured a CLP 645 last week and it is an absolute joy to play! 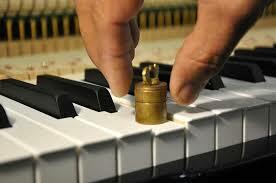 The wooden keys makes a tremendous difference and bring the playing experience so much closer to an accoustic piano. My only issue, is that the CLP645 models here in South Africa does NOT have the BlueTooth connectivity. As stated in the manual, it is not included in all regions for the CLP 645 model. But this does not detract from the stunning instrument this is. Thanks for the useful review! Thr CLP 645 is absolutely amazing, thanks for the great review. Very useful in making a decision. My only issue is that bluetooth functionality is not present for the CLP645 here in South Africa. I noticed it is stated in the manual that bluetooth is not available in all territories. I'm not sure why this was not clearly expressed by Yamaha anywhere else. Great instrument none the less. I tried a Roland 607gp in a local store last week, but I'm having buyer's remorse because of problems with delivery, AND reading your review of this Yamaha mini grand. I am a total beginner, but I liked the keyboard and sound of the Roland. Would you say than the Yamaha is a better sounding and more pleasant playing instrument? I remember reading your very positive review on the Roland 607 earlier. Hi Tim, between Roland GP607 and Yamaha CLP 665, which one do you prefer, for sound quality and realism? Thanks! Hi Tim, Im between Casio AP-650 and Yamaha 635 or 645 for my wife (12 years acustic piano). Which one do you prefer according a key action and sound? 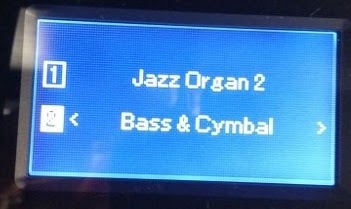 I heard both Yamaha yesterday, unfortunately I can´t find a store with Casio. Thank you for your reply. 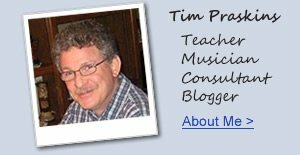 Tim, congratulations on your reviews, which I find very interesting and useful. CLP645. MUCH BETTER piano sound chip and operating system as compared to the older CLP575. Even though the CLP575 uses the same key action as the CLP645 (which I like very much) and also has an upgraded internal speaker system, the piano sound realism in the CLP645 along with the new operating system is SO much better that it is not worth it in my opinion to buy the older CLP575. Hi Tim. Your reviews are simply the best, thanks. I want to go a step further from my kawai es100. After reading some and based on availability in my regional, I came down to three models. Kawai CN37, Yamaha CLP-645 and Roland HP-605. Not sure if the came with bluetooth in my region but they are at almost same price range.